Welcome! This website is devoted to DC Comics' Superman, the first and best comic book superhero, who was created by Jerry Siegel and Joe Shuster. This website is dedicated to giving you information on Superman in all forms of media. Jump to these sections of the Superman Homepage by clicking on the navigational links in the menu above. What's New - Start with this section which lists recent updates to this website. News - Here you'll find all the latest news on events surrounding Superman! Comics, Movies, Television... For all the news and rumors surrounding Superman in any medium! Comics - Complete Index of Superman comics since 1986. The "Mild Mannered Reviews" reviewing all the Superman-related comic books. "Who's Who in the Superman Comics" outlines profiles and history on all the major Superman comic book characters. Don't miss our Exclusive Interviews with Superman Comic Book Creators. And there's a whole stack of other comic book related articles, FAQs and information files. 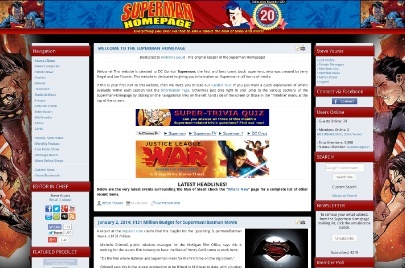 Movies - Detailed information and reviews for all the Superman movies and Kirk Alyn serials. Information and Episode Guide for the Fleischer Superman cartoons. Cast & Crew biographies, Superman movie news and rumors, and exclusive Interviews with famous Superman movie personalities! 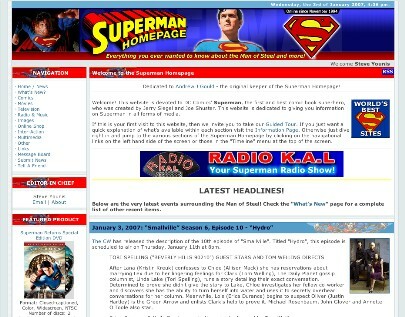 Television - Episode Guides and information on all of Superman's appearances on TV including "Superman: The Animated Series", "SuperFriends", "Lois & Clark", "Smallville", "Justice League", "Supergirl", "Krypton", and more. TV Airing Schedule Search Engine, Cast & Crew biographies, Interviews, and a whole lot more! Radio & Music - Detailed historical information regarding Superman's adventures on Radio, including information on the BBC Radio audio dramas and the "Superman in Songs" list! Online Store - Your one stop shop for buying Superman merchandise online! Comics, Books, Videos, DVDs, Blu-rays, Action Figures, Statues, Games, Magnets... it's all here! 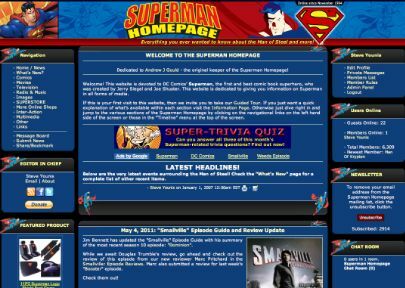 Inter-Action - Test your knowledge in the SuperTrivia Quiz, send your friends a Superman Homepage Virtual Postcard, subscribe to the free Superman Homepage newsletter, and have fun with some Games & Puzzles. Multimedia - Sounds, Movies, Wallpaper images! 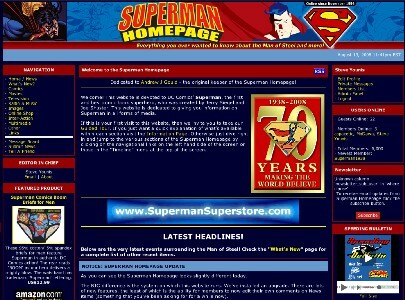 A massive collection of Superman-related multimedia files. Other - Superman related information that doesn't really fit under any other catagory, including Superman Recipes, Superman on Broadway, Action Figure and Trading Card checklists. 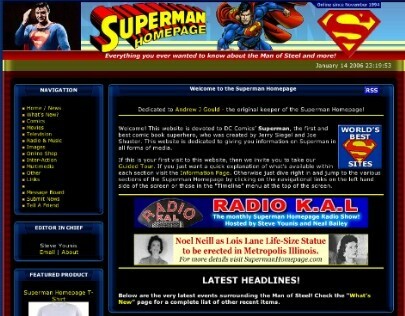 Check out the "Real World" section which includes reports on the annual Superman Celebration in Metropolis, Illinois. 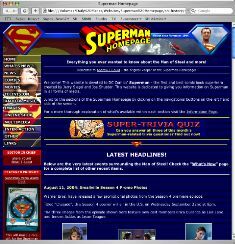 Links - A list of links to other Superman and DC Comics related websites, including Official websites, Unofficial fan sites and Resource sites. 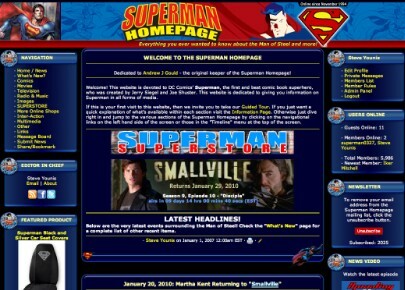 Send your comments regarding the Superman Homepage to me (Steve Younis) via our Feedback Form. 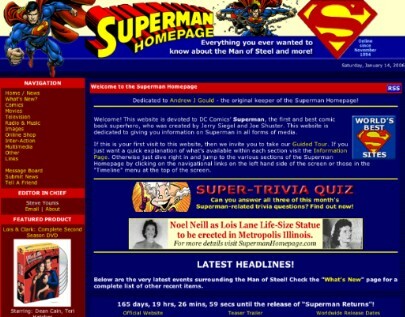 Christopher Reeve Homepage - Information about Christopher Reeve. News, Reviews, Links and much more! Steve's Stuff - Songs, Stories, Poems and much more! 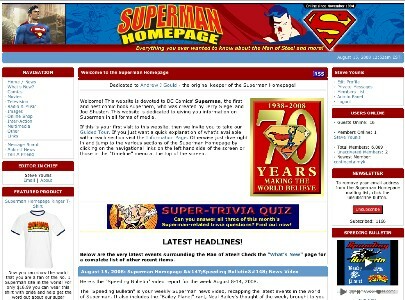 An historical look at the "Superman Homepage"
Thanks to a fan (known only as "clemsonfn") who turned up in our old Superman Homepage Chat Hour one week, I was able to locate and save a slice of "Superman Homepage" history. 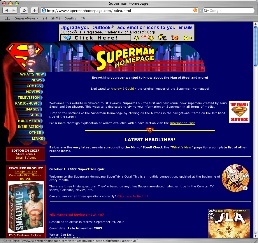 What you're about to look at is a "That Was Then, This Is Now" view of the Superman Homepage website. 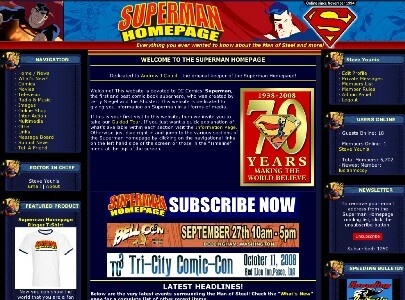 You'll see how the Superman Homepage has evolved over the years. See how we've grown, how the site's design has changed, see how the content has expanded. I often wonder what Andrew would think of the website as it stands today. Would he approve? I'm still in awe of his dedication back then... He was a one-man band. Confined to his house. Physically challenged by his failing health and dibilitating disease. I don't know how he did it. Andrew, I salute you! 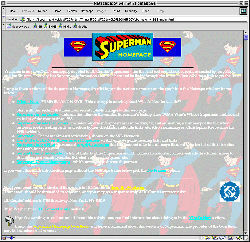 Besides Andrew's 1996 version, we show you what the website looked like when I first took over in late 1996 - early 1997. 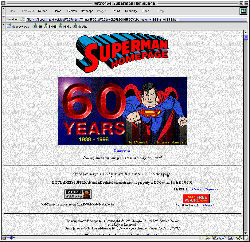 Then again in 1998 as the website matured. 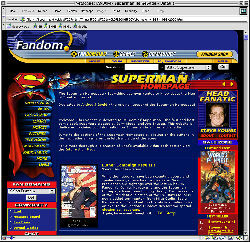 See the way the website looked in the prosperous days of 1999-2000 when the Superman Homepage was part of the FANDOM.COM family. 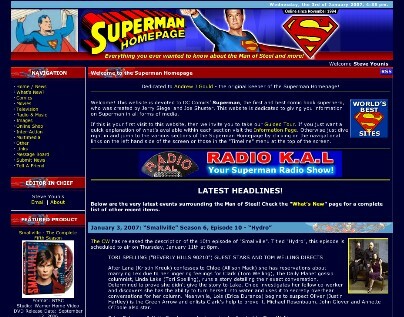 You'll also see what the website looked like after the closure of Fandom.com, when the website returned to a completely free and fan-owned existence and its own domain name address at www.supermanhomepage.com in 2000 and other modifications since then. 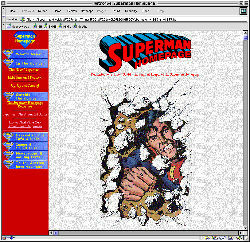 Hopefully, for those of you who are new to the Superman Homepage website, this historical look will give you an appreciation for how far the website has come. For those of you who have been around since those early days, I hope you enjoy this nostalgic trip back in time.